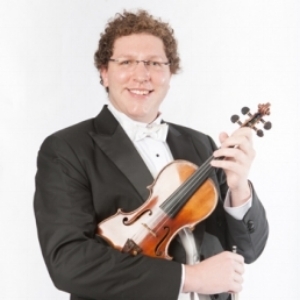 Violinist Noah Geller has performed extensively throughout the United States and abroad. At the invitation of Music Director Michael Stern, Geller became the Kansas City Symphony concertmaster in 2012. He has since appeared frequently as soloist with the Symphony. He made his solo recording debut on the Kansas City Symphony’s most recent release with Reference Recordings featuring music by Saint-Säens. In addition to his activities at the Symphony, Geller is an enthusiastic music educator. Upon his arrival in Kansas City, he was appointed to the position of adjunct associate professor of violin at the University of Missouri-Kansas City Conservatory of Music and Dance. Geller began his professional career in the ﬁrst violin section of the Philadelphia Orchestra in 2007 while still pursuing his master’s degree. He served as acting assistant concertmaster of the Philadelphia Orchestra for the 2010 and 2011 seasons. Geller also has performed as guest concertmaster with the Pittsburgh Symphony Orchestra and the China National Symphony Orchestra (Beijing). An active chamber musician, Geller has performed at the Marlboro, Kingston, Saratoga, Heartland and Taos festivals, and he has appeared on the Lyon and Healy (Chicago), Philadelphia Museum of Art, and Lyric Chamber Music Society (New York) series, among others. He is an original member of Shir Ami, an ensemble dedicated to the music of composers whose lives were adversely affected by the Holocaust. During the past two years, Geller has organized and presented concerts by Shir Ami for the Kansas City community, garnering remarkable support and enthusiasm. Geller grew up in the Chicago area, studying privately with Jennifer Cappelli. He received his bachelor’s and master’s degrees from The Juilliard School where he studied with Hyo Kang, Donald Weilerstein and Cho-Liang Lin. Geller currently lives in Kansas City with his wife, percussionist Mari Yoshinaga, and their dog, Monkey. He performs on a violin made by Andreas Postacchini c. 1840.